Pocketburgers.com: Police discover 20 large-scale cannabis factories in Britain every day - so are we now a drugs EXPORTER? 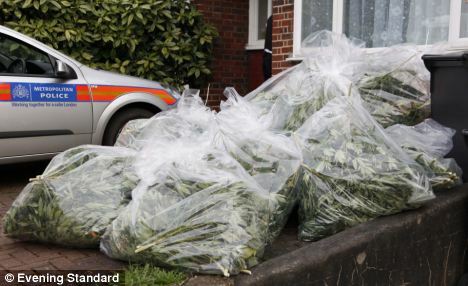 Police discover 20 large-scale cannabis factories in Britain every day - so are we now a drugs EXPORTER? Previously, the UK relied on smuggled supplies of the illegal drug, from countries such as Holland and Morocco, because homegrown crops did not meet demand. 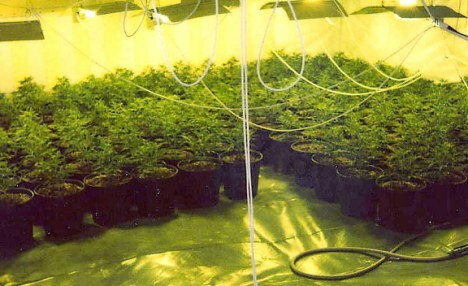 into how cannabis farms have sprung up across the UK. They are often run by immigrant gangs from the Far East, though there is evidence they are now joining forces with home-grown criminals. to break into farms run by rival gangs. The properties are being booby-trapped – with window frames wired to the electricity mains. It is more than eight times the annual average between 2004 and 2007. More than 1.3million plants worth an estimated £150million were recovered in the past two years. Last year alone, police seized almost 750,000 plants with an estimated yield of £85million, compared with more than 500,000 plants worth £65million the year before. ‘There is now a market for exportation,’ the police chiefs warn, though they are yet to gather intelligence that this is happening. The highest number of factories – 896 – were found in the West Yorkshire force area. The largest factory found was in an industrial unit in Haddenham, Cambridgeshire, where more than 7,600 plants were recovered with an estimated yield of £2.5million, the report said. of choice for large-scale cannabis cultivation’. Acpo also found the premises used for cannabis cultivation were becoming more varied and included disused industrial buildings, former pubs, cinemas, nightclubs, hotels, print works and even banks. crimes such as counterfeiting currency and DVDs, money laundering, immigration crime, firearms, blackmail, prostitution, theft and people trafficking. Reports of factories being ‘taxed’ by other criminals have led to criminals arming themselves with machetes and sawn-off shotguns. gate wired directly to the mains. Running a cannabis farm would lead to the criminal charge of producing a Class B drug – punishable with up to 14 years in jail. Many of the factories are found after tip-offs from neighbours who notice blacked-out windows, hot walls, condensation or ‘strange aromas’.